What was the Hermetic Order of the Golden Dawn? The organization of the Golden Dawn and the contents of both its rituals and teachings connect it to the wider phenomena of western esotericism. It was not an isolated organization created in a vacuum but part of a larger tradition of esotericism in Europe dating back to the Renaissance. This connection can be seen by the methods used to bring members into the order and by the symbolism and framework around which the Golden Dawn was organized. By an examination of the complex formed by these, it can be seen that the Golden Dawn contains the components of western esotericism as defined by Antoine Faivre and discussed in Chapter Two, which shows that it is linked to a larger current of thought and practice, instead of simply being an isolated product of the 19th century. It also shows that the order owes the basis of its practices and beliefs to groups and traditions which preceded it as well as the inspiration of its founders. In order to demonstrate this connection, it is necessary to discuss the specific symbolism which informed the order’s teachings and the framework that these teachings existed within. It is this framework informed by symbolism through which Golden Dawn members were passed as they advanced in the order and their studies within it. The symbolism used by the Golden Dawn in its rituals is drawn from the Christian Cabala and a specific understanding of a symbol, the Tree of Life, as understood within the Cabala. This formed the underlying structure that informed the symbolism for all ritual activities within the Golden Dawn. Therefore, some understanding of the Cabala is necessary in order to discuss the Golden Dawn, its rituals, and beliefs. As was stated in Chapter Two, the Cabala was originally a form of Jewish mysticism and it survives as such today. Cabala is an “esoteric system concerning the secrets of the divine realm which begins in the late 12th century…” (Dan 639). 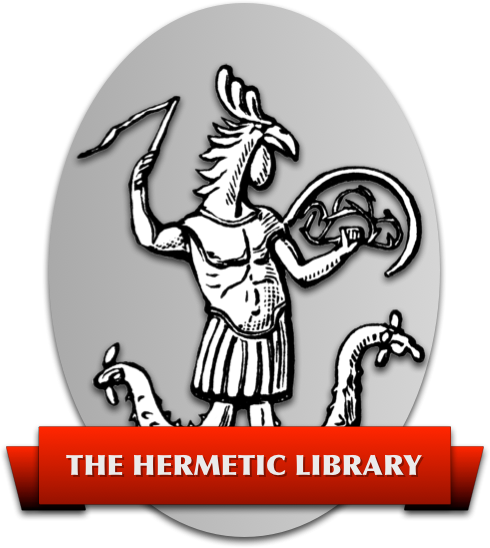 During the Renaissance, a number of individuals borrowed elements of Jewish Cabala to create a Christian Cabala that aligned itself with the Hermeticism derived from the Corpus Hermeticum combined with Neoplatonic philosophy. This was largely through the work of Marsilio Ficino and Pico della Mirandola followed by a host of successors (Yates 84-86). The Neoplatonic influences were in two forms, those of early Christian and non-Christian philosophers. The Christian influence was largely through the work of Pseudo-Dionysius and his Celestial Hierarchies. This text was heavily informed by the Neoplatonic philosophy of the early Christian era and organizes the angels that serve the Christian God into nine orders arranged by triads (Yates 117). Ficino quotes heavily from the Celestial Hierarchies throughout his work and was also influenced by Dante’s understanding of the angelic orders as expressed in his work (Yates 117, 119). Within this theology, the angels act as the messengers and as active agents upholding the divine laws and order of a singular creator of the universe, God. In the Golden Dawn’s vision of the Cabala’s Tree of Life, these orders of angels were seen as actively present and each order was assigned to a location on the Tree of Life and ruled by a specific archangel as their prince (Regardie, The Golden Dawn 96-98). Mirandola also quotes extensively from Pseudo-Dionysius in his Cabalistic writings (Yates 121). These writings include Mirandola’s synthesis of a threefold understanding of the universe into Supercelestial (divine), Celestial, and Terrestrial worlds with one triad of the orders of angels in each of them (Yates 122). Mirandola’s understanding is mirrored in the tenfold symbolism of angels on the Tree of Life in the Golden Dawn as well. In addition to being the first translator of the Corpus Hermeticum into Latin, Ficino also studied and translated the work of the late Neoplatonic philosophers, specifically Plotinus, Proclus, and Iamblichus (Yates 56-57, 65-68). Iamblichus’ De Mysteriis, which was translated by Ficino, was originally written by Iamblichus as a philosophical defense of theurgy (magia) and associated ritual practices in the face of criticism by his peer and fellow philosopher, Porphyry (Shaw 5-7). Later, this text served as the basis and justification for theurgy in multiple communities from the fourth century through to the 10th century and Ficino revived the practice of theurgy with his translation of this text (Shaw 6). Use of this Neoplatonic thought to justify a spiritualized ritual activity combined with the specifically Christian work of Pseudo-Dionysius allowed Ficino to merge non-Christian and Christian Neoplatonism with other Christian thought into the active system of magia that he developed and practiced (Yates 68). The work of Ficino and Mirandola was eventually synthesized into a body of esoteric thought published by Cornelius Agrippa in his encyclopedic De Occulta Philosophia in 1533 (Yates 130-131). As Hanegraaff states, this was an immense compendium of astrological and magical lore (393). Yates describes Agrippa’s work as a “clear survey of the whole field of Renaissance magic” and it became a standard reference work on such throughout the Renaissance and afterwards (130). The eventual result was a system of magical practice in the Renaissance and beyond that was rooted in Jewish Cabala but also borrowed heavily from both Classical Neoplatonic and Christian traditions of esoteric thought. Both Westcott and Mathers show themselves in their writings to be familiar with Agrippa as well as Pseudo-Dionysius (see Regardie, The Golden Dawn 611-613 and Westcott, “Angels” in The Magical Mason 125). Traditional Jewish Cabala was heavily focused on the analysis of sacred texts, especially the Torah and The Zohar, a medieval Jewish Cabalistic text (Green 4-5). 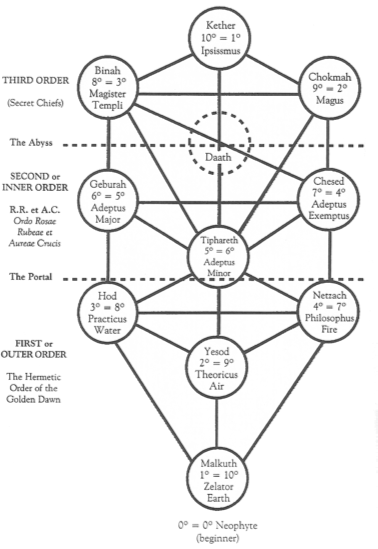 The Golden Dawn’s version of Cabala focused more strongly on the Tree of Life diagram, the symbolism associated with this diagram, and the use of key Cabalistic texts, specifically the Sefer Yetzirah and the portions of The Zohar translated by Mathers. Specific Old Testament symbolism deriving from Genesis involving the creation of the universe and the expulsion of Adam and Eve, the primeval humans, from the Garden of Eden also played a role in the symbolism of the ceremonies (Fuller, The Order of the GD: Vol. I 113-115, 160-161). Direct influence from The Zohar came with Mathers through his translation and publication of three books from within The Zohar in the years prior to the founding of the Golden Dawn as “The Kabbalah Unveiled” (Mathers, The Kabbalah Unveiled vii). Mathers’ text was a translation of an earlier translation into Latin of the Zohar by the Christian, Knorr von Rosenroth as the “Kabbala Denudata”, which connected the work of Mathers to that of the Christian Cabalists of the Renaissance (McIntosh 99). Fig. 2. The Golden Dawn’s Tree of Life from Israel Regardie, The Golden Dawn (62). Within the beliefs of the Golden Dawn, each sephira (the singular) has associated with it a number, a divine name of God in Hebrew, an archangel, an order of angels, a color, and an element (from the Aristotelian four elements) along with other symbols (Regardie, The Golden Dawn 64). This array of ten spheres is connected by 22 paths, which are also numbered. In a manner similar to the sephiroth, the associations for the 22 paths connecting them include the assignment to each of one of the 22 Hebrew letters of their alphabet, one of the 22 Major Arcana tarot cards, a divine name of God in Hebrew, and an elemental association. These associations are noted in the Fourth Knowledge Lecture of the Golden Dawn, which was studied by members of the Philosophus grade (Regardie, The Golden Dawn 72). This lecture notes that these paths are the means of connecting the sephiroth of the Tree of Life and mediate between the qualities of the sephiroth, which they connect (Regardie, The Golden Dawn 72). Before you stands the Tree of Life formed of the Sephiroth and their connecting paths… Upon each Sephira are written in Hebrew letters its Name, the Divine Name ruling it, and those of the Angels and Archangels attributed thereto. The Sepher Yetzirah is a key source for the Golden Dawn’s Cabala and references to it appear throughout the body of Golden Dawn rituals and texts. It is worth noting that Westcott publicly published his own translation of the Sepher Yetzirah in 1887, before the founding of the Golden Dawn (Gilbert, Companion 193). New members of the Golden Dawn were exposed to this text as soon as they joined the order. The Sepher Yetzirah is explicitly referred to in the lecture at the end of the Neophyte ritual, the first ritual taken by a new member, when the Hierophant states to the new member, “…the cubical altar is emblematical of the Material Universe, which is described to us in the Sepher Yetzirah or Book of Formation as being ‘an abyss of Height and an abyss of Depth, an abyss of the East, an abyss of the West, an Abyss of the North, an abyss of the South’” (Fuller, Vol. I 23). Green notes that “in the Sefer Yetsirah the sefirot seem to be the numerical ‘building blocks’ of reality; the existence of the sefirot indicates a certain multiplicity or multifacetedness within the divine unity, a tentative ‘many’ within the absolute One” (35-36). The sephiroth echo the order of the creation of the universe and progressively appear, starting from the first sephira at the top of the Tree of Life, Kether, and proceeding from sephira to sephira until the final one at the bottom of the Tree, Malkuth is reached. This is seen as the order of the creation of the universe in an emanationist scheme moving from inexpressible unity through to the concrete plurality of the physical world. Green notes that “as stages in an ongoing process of inner divine revelation, the sefirot will emerge one after the other, each deriving from and dependent on the one before it” (35). At the stages along the way, as a sephira emanates from the one preceding it, a quality is expressed by the new sephira that was present latently in the ones preceding it. Kether represents an undivided and undifferentiated unity which is full of all possibilities and qualities, the first expression of divinity into creation. The final sphere, Malkuth, means “Kingdom” and it represents the physical world of day to day life for the Golden Dawn. Within the teachings of the Golden Dawn, this is a physical world in a fallen state or divorced from the world of God or divinity at this time (Fuller, Vol. I 160). For traditional Jewish practitioners of the Cabala, Malkuth is the point or gate where divine energy emerges into the physical world (Green 53). Gershom Scholem states, “the living forces of the Godhead pass into Creation through the medium of the last Sefirah…” (Mystical Shape 43). This progression of emanation within the Tree of Life is symbolized by the Flaming Sword of the Cherubim from the Biblical book, Genesis, in chapter 3, verse 24, which barred the entrance to Eden when Adam and Eve were cast out of it (Fuller, Vol. I 43-44). This sword is represented in Figure 2 starting from the crossed hilt at the top of the diagram and proceeding through each sephira in their order of emanation, which follows their assigned numbers from one through ten. The Serpent of Wisdom on the Tree of Life diagram represents the path followed by those attempting to return to unification with divinity, proceeding from Malkuth, at the bottom, to Kether, at the top of the Tree. In the Theoricus ritual, the initiate is told, “The course of the Hebrew letters places upon the Paths form as you see, the symbol of the Serpent of Wisdom, while the natural succession of the Sephiroth themselves form the Flaming Sword…” (Fuller, Vol. I 77). This explanation is immediately followed in the knowledge lecture by a table giving the Tree of Life symbolism, including the Divine Name, Archangelic Name, and Choir of Angels for each sephira of the Tree of Life in English and Hebrew for the memorization of the Zelator grade initiate (Regardie, The Golden Dawn 64). The Tree of Life and its associations provide a rich framework of symbolism which is used for the initiatory rituals of the Golden Dawn and within its system of practice and belief as a whole. The attribution of the names of God, archangels, orders of angels, elements, and colors allowed the Golden Dawn and its members to use these attributions as symbols informing their ritual work, personal practices and even such simple things as the color of a piece of clothing worn by an officer or of a talisman created by an initiate. Every item used in ritual had correspondences, usually many, that connected it with the symbols associated with the sephiroth and paths on the Tree of Life and, therefore, with the principles, ideas or qualities symbolically represented by these sephiroth or paths. The framework which all of this symbolism most directly informed within the Golden Dawn is its structure of grades and their associated initiation rituals. All of the ritual activities of the Golden Dawn which were engaged in as a group and which directed the solitary practices of individuals were organized around these initiation rituals and the teachings associated with each of them in the form of papers and lectures. These rituals were informed by the Golden Dawn’s understanding of the Cabala and the Tree of Life. Members of the Golden Dawn symbolically progressed through the Tree of Life towards a union with divinity and knowledge of their higher or spiritual selves by means of these ceremonies of initiation. The Z1 paper explaining the symbolism of the Neophyte grade states: “… so the sacred rites of the Temple may gradually, and as it were in spite of themselves, raise the Neophyte unto the Knowledge of his higher self” (Fuller, The Order of the GD: Vol. II 106). This unifying symbolism took a common initiatory framework used within many fraternal orders and created a vehicle for the initiation of the members of the Golden Dawn into a specific tradition of practice with an associated spiritual understanding of the world. The knowledge of this understanding separated the initiated members of the Golden Dawn from those outside the order. This was taught through the content of these rituals and the teachings conjoined with them and the members put this knowledge into practice through personal work. Neither the rituals nor the teaching can be divorced from one another in order to understand the experience of a member of the Golden Dawn. The ritual initiations were as much a part of the experience of members of the order as any texts or lectures to be studied and learned. In a manner similar to Freemasonry and its degrees, the Golden Dawn was organized as a hierarchical order based on grades achieved through progressive advancement. Each of these grades conferred a title within the order and contained a curriculum of study and lectures on esoteric topics. After undergoing the initiation ceremony for a grade, members were expected to master its curriculum of study. This curriculum included “elemental occult symbolism (i.e. 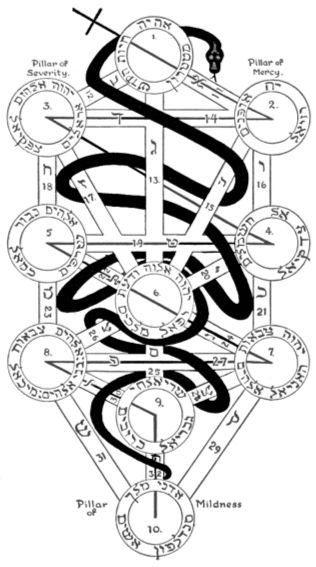 alchemical and astrological), the Hebrew alphabet, the Cabbalistic Tree of Life with its ten Sephiroth and twenty-two Paths, the Divine Names attributed to the Sephiroth, the attributions of the twenty-two Tarot Trumps (i.e. their supported correspondences with the twenty-two Paths), Geomancy, and so on” (Howe 59-60). Members were tested on the topics in the curriculum of each grade before being allowed to continue to the next one. The eventual, final, grade within the First Order of the Golden Dawn was that of Adeptus Minor. After the creation of the Second Order (or Inner Order) in 1892, this was changed so that members passed through the “Portal” grade, which served as a gateway before being admitted to the Second Order with their achievement of the Adeptus Minor grade (Howe 58). This Second Order then had its own program of study which was primarily focused on ritual or visionary activities instead of simple memorization of symbolism. In the First Order, the only ritual practice taught was a single pentagram ritual to be practiced by members as a self-purification ritual (Howe 60). The Golden Dawn associated each of its grades of membership with one of the sephiroth with the exception of two grades. These associations are shown in Figure 3, which illustrates the grades of both the First and Second Orders mapped onto the Tree of Life. As can be seen there, the Neophyte grade is actually outside of the Tree of Life and is the preliminary state of a newly initiated member before they begin to ascend the Tree through Malkuth in the following grades (Fuller, Vol. I 44-45). The Portal grade acts as gateway through a symbolic barrier or veil before entry into the Adeptus Minor grade and the Second Order. Fig. 3. The Golden Dawn Grades on the Tree of Life from Darcy Kuntz, The Complete Golden Dawn Cipher Manuscript (32). The grades move up the Tree of Life away from Malkuth and towards Kether. Each grade is commonly referred to by both its name and its number. The first number is the number of the grade in the order’s progression, starting with zero for the Neophyte grade because it is outside of the Tree of Life. The second number is the number of the sphere associated with the grade as shown in Figure 2. The Zelator grade is thus 1=10, since it is the first full grade of membership and is associated with Malkuth, the tenth sphere on the Tree of Life. Theoricus, the second grade, is associated with Yesod, the ninth sphere, making it 2=9. This pattern continues up the Tree of Life. Additionally, each of the four grades following the Neophyte grade is associated with one of the four Aristotelian elements (earth, air, water, fire) in their progression. This has the end result within the Golden Dawn that when the member passes through the Portal grade to become an Adeptus Minor, all four of these elements have been passed through ritually and are symbolically purified within the initiate before they join the Second Order. In all fraternal orders, whether esoteric or more mundane in beliefs, entry into the various degrees of membership is based on initiation ceremonies done in a dramatic manner. All knowledge, often such simple matters as who is a member of an order, is only accessible in a graded manner following the admission of membership to both the order and then higher grades through these ceremonies. This initiatory ritual work follows the same general pattern with specifics varying from organization to organization even in relatively non-esoteric organizations. Grade or degree rituals are progressive with the symbolism they use building upon that of previous levels of membership and their rituals. This layering effect with symbolism and ritual actions culminates in a final degree or grade in a series, such as “Master Mason” in Blue Lodge Freemasonry and “Adeptus Minor” in the First Order of the Golden Dawn. Uninitiated members have no foreknowledge of the content of an initiation ritual and are commonly blindfolded during portions of it, heightening a sense of disorientation and surprise, as well as concealing the activities that occur in the space during the initiatory rite. During the course of the ceremonies, oaths are sworn not to reveal the contents of the initiation rituals to outsiders and members who have not yet gone through them, maintaining the secrecy of the rituals from prospective members and the public. The common pattern for such initiations is as follows: the initiate members are brought to an antechamber and given special clothing to wear for the ritual, often a simple robe or similar garb. They wait there until a ritual officer, a guide, comes to retrieve them. When this occurs, the initiate is blindfolded and led into a darkened ritual space by this guide. During the course of the ritual, the initiate is led about a room by the guide, who ensures the initiate arrives at the proper location as needed for the ritual. Throughout the space, normally a large room, there are other ritual officers engaged at stations assigned to their roles. These officers are garbed in clothing or regalia specific to their role and carry implements of a symbolic nature within the organization’s body of symbolism (such a rod capped in a symbolic headpiece, a cup of water, or a sword). As the initiate is led blindfolded about the space by the guide, these officers engage in speeches or actions carrying a meaning according to the symbolism used by the fraternal order. Speeches may be in verse or drawn from a text, such as the Bible. They may also be accompanied by loud, odd, or sudden noises, incense, or lights. The initiate periodically has the blindfold removed by the guide for interactions with these officers or for the display of objects and images of symbolic importance. In the case of the Golden Dawn, there are often drawings of portions of the Tree of Life or arrangements of ritual implements on an altar. The ritual officers will often challenge the initiate with questions demanding a specific response, which is either given by the guide as the initiate’s proxy or freely by the initiate. In some rituals, the initiate is asked to engage in a symbolic action, such as kneeling or holding an object. Following a series of such interactions or events, the initiate has his or her blindfold removed and is given an oath to swear binding the initiate to silence concerning what has transpired during the initiation. At this point the ritual is ended and the initiate is congratulated on passing through the ordeal of the initiation. At that time, any passwords or signs of recognition used by the organization to prove membership (or degree of membership) are communicated to the newly initiated member so they may prove their rank if challenged to do so. This communication is followed by a lecture given by an officer on the symbolism of the initiation ceremony, the actions of the officers, or of the things seen or heard during the course of the ritual. This basic pattern has been used in Freemasonry since at least the 17th century for its ceremonies (Stevenson 153-154). It has subsequently been adopted by other fraternal orders. Examples of this type of ritual can be found in the Entered Apprentice degree of Freemasonry in Duncan’s Masonic Ritual and Monitor on pages 7-47 and in the Neophyte ritual of the Golden Dawn in Fuller, Vol. I on pages 1-32. The primary difference in the Golden Dawn’s initiation rituals from those of others organizations was that their rituals followed a specific and cohesive body of symbolism drawn from Cabala and this symbolism was then used to provide the basis for all of the ritual activities engaged in by members of the order in their studies and, later, spiritual practices. How does the Golden Dawn fit into the definition of western esotericism that Faivre, Hanegraaff and others use in practice? In Faivre’s definition as discussed in Chapter Two, there are four features that are necessary for a tradition or activity to be categorized as part of western esotericism. These features are: (1) Correspondences; (2) Living Nature; (3) Imagination and Mediations; (4) The Experience of Transmutation. Additionally, there are the two non-essential features, The Praxis of the Concordance and Transmission (Faivre, Access 10-14). The work of the Golden Dawn can be examined for these features to show how the Golden Dawn’s practices fit into the framework of this definition. Both the initiation of a member into the Golden Dawn as a Neophyte and the various rituals practiced by its members (such as evocation, talisman creation, divination, alchemy and spiritual development) follow the same pattern as envisioned by MacGregor Mathers. The Z2 paper written by him abstracts this pattern into a formula that tallies or notes the symbolic events that occur during the Neophyte initiation in a list that outlines the entire ritual and its activities. Mathers then shows how the same formula can be applied to other ritual activities by mapping the elements of these activities to correspond with those within the Neophyte ritual (see Fuller, Vol. II 149-201 for the examples). The result of this formula is that the rituals engaged in by members of the Golden Dawn reflected the same symbolism that had been used when they became members, unifying all ritual activities into one symbolic whole using the same formula. This is one of the unique features of the Golden Dawn and its system of ritual practice. While there were other groups that engaged in initiation ceremonies and even a few that taught practical mysticism or occultism, no other group unified the symbolism used in both the initiatory rituals and personal rituals into a single, unified system of practice. Faivre’s definition of western esotericism can be applied against this formula and the way that the Cabala and the Tree of Life were used within the Golden Dawn. The component of Correspondences is present in the way in which the Cabalistic Tree of Life is used to map of a variety of symbols into one structure within the Golden Dawn. A specific sephira on the Tree of Life corresponds to an abstract concept, such as “Wisdom” for the sephira Chockmah, but also to an astrological planet, a metal, a divine name, an archangel, an order of angels, an element, a set of four colors, a number, and the shapes associated with this number. Each sephira also exists in a relationship to the others in a hierarchical scheme which the Golden Dawn viewed as replicating both the creation and structure of the cosmos. These sephiroth are mediated as qualities by the 22 paths which connect them and which have their own associated symbols. The Tree of Life and its symbolism also acts as the unifying theology needed for the Praxis of Concordance. This symbolism allowed tarot cards, alchemy, and astrology, which were otherwise distinct traditions historically, to be mapped within the one overall structure provided by the Tree of Life through being associated with components of the Tree. Additionally, the various activities of initiation rituals, the creation of talismans, divination, or the development of the spiritual self are seen as partaking of the same underlying formula as described in the Z2 paper. This formula is also structured in accordance with the symbolism of the Cabala as understood by the Golden Dawn. Thus the Cabala and the Tree of Life form the underlying basis that allows these otherwise disparate sets of symbols and traditions of practice in western esotericism to be joined together as part of a larger whole to create a coherent, synthesized tradition. The Tree of Life forms a ladder or chain of being that extends from an undifferentiated formed unity filled with potential to the multiplicity of forms of the physical world with each stage along the way expressing different spiritual attributes. By manipulation of the correspondences or sympathies existing within the levels of the Tree of Life, the members of the Golden Dawn believed that changes could be affected in themselves or the world around them. The symbolism of the Tree of Life is enacted in a ritual manner in the creation of members of the Golden Dawn and in the fulfilling of other ritual activities. All of these actions follow the same formula of initiation that is outlined in the Z2 paper. It is through the mind or imagination of the adept or initiate that this formula is enacted. This fulfills the dual requirements of Imagination and Mediation in Faivre’s definition. The Imagination is the mind’s eye with which the adept of the Golden Dawn sees the reality behind the symbols which he or she is using ritually. Otherwise, an initiation ritual would only be a participatory play, a wand a colorful stick, and the planets simply rocks in space. These imagined symbols are the mediators that are used to engage in actions within the world, whether this is the material world or the unseen mental or spiritual world believed in by members of the Golden Dawn. The symbols invest meaning to their ritual actions. These symbols act to connect these various worlds because all of reality is seen as being present within the Tree of Life and the symbols it contains through the sephiroth and their interrelationship. The physical world is only one part of the Tree of Life in this view. As Faivre says, imagination “allows the use of these intermediaries, symbols, and images to develop a gnosis” and it is able “to put the theory of correspondences into active practice…” (Access 12). It is this activity through mediation that separates a speculative mysticism from the actions expressed through theurgy or magia. In the beliefs of the Golden Dawn, the Experience of Transmutation is the result of the use of these mediating symbols through the means of imagination. These symbols represent the correspondences in a living nature. Actions through them can affect the world using the formulas of initiation. This brings about the metamorphosis that transmutes the uninitiated person into a member of the Golden Dawn and then, through the progression of grades, to this member becoming an adept initiated into the spiritual realities of the higher portions of the Tree of Life. The goal of the adepts of the Golden Dawn was to transform and purify the forces of the Tree of Life within themselves so that their “Higher Genius shall descend into the Kether of the Man, bringing with him the tremendous illumination of his Angelic Nature” and give the adepts the ability to walk with God as did the Biblical prophet, Enoch (Fuller, The Order of the GD: Vol. III 167-168). The adepts sought a spiritual knowledge or gnosis through their active use of ritual and symbolism to transform them. This allowed the adepts to be transformed from the uninitiated souls wandering in darkness in the Neophyte ritual into beings with the knowledge of the light of God (Fuller, Vol. I 23-25). This transmutation was given ritually by the officers of a temple of the Golden Dawn, who had received it themselves from others before them. This is the last element of Faivre’s definition, Transmission. As was discussed in Chapter Three, this chain of transmission was actually mythical for the Golden Dawn because Westcott and Mathers fabricated its history and grand lineage of ancestors. The members undergoing the rituals of the order were unaware of this and believed that they were receiving a transmission passed from the chiefs of the Second Order through their initiating officers to the initiated members (Gilbert, Twilight 101). This is one of the reasons why the discovery of the true origins of the Golden Dawn must have been so disquieting to its members. They had been led to believe that they were part of a great initiatory chain that went back through history but found out that this was based on a lie. It is interesting to note that even when this knowledge became public within the order and it fractured into several organizations, the members continued to work the system of initiation and ritual practices that they had been taught. It would seem that whatever truths they found for themselves in the Golden Dawn and its teachings outweighed their discovery of its mythic origins in time. It can be clearly seen that the practices and beliefs of the Golden Dawn contain all of the components of Faivre’s definition of western esotericism. It is also clear that the Golden Dawn drew from practices that preceded them in the work of Ficino, Mirandola, and Agrippa in the Renaissance and, through these figures, to the earlier Christian and non-Christian Neoplatonic and Jewish traditions. This ties the Golden Dawn into an overall tradition of esoteric inquiry and practice in the West instead of it simply being the creation of a few 19th century Freemasons. The fundamental organizing principle of the Golden Dawn is its vision of the Cabalistic Tree of Life passed through the framework of initiatory rites. The following chapters will examine the vision of the soul in these rites and their teachings within the Golden Dawn as well as examining the precursors to that this vision in earlier traditions that informed and helped give rise to it.